PROVIDENCE, R.I. — World soccer legend Eusebio headlines the list of nine inductees at the New England Soccer Hall of Fame’s 38th annual Induction Dinner on Sunday, Nov. 22, noon at the Ramada Inn in Seekonk, Mass. Eusebio helped Lisbon, Portugal club Benfica win 11 league titles and the 1962 European Cup, and scored a tournament-high nine goals during the 1966 World Cup. He was voted one of the 20th century’s top players. 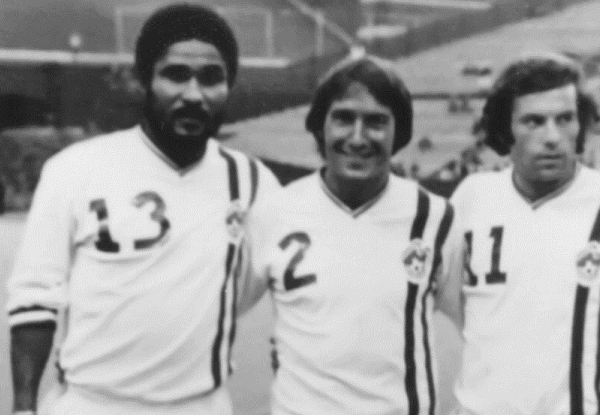 Eusebio played for the Boston Minutemen in 1975, and his appearances in exhibition matches around New England always guaranteed large crowds. He died in 2014 at the age of 71, and will be honored posthumously. * SHAUN BAILEY — A native of Colchester, England, Bailey is the head coach of A.C. Connecticut in the PDL and spent past the decade as an assistant coach at Western Connecticut State University. * JAVIER CENTENO — A two-time All-American at the Community College of Rhode Island and an all-star midfielder for the USISL’s Rhode Island Stingrays, Centeno is a Co-Founder of Project GOAL, an non-profit organization dedicated to helping children achieve academic goals and social awareness through soccer. * DARREN EALES — A First Team All-American and Ivy League Player of the Year at Brown University, Eales is the president of the Major League Soccer expansion club, Atlanta United FC. * NANCY FELDMAN — In her 21st season as head women’s soccer coach at Boston University, where she began the program, she has guided the Terriers to 12 league championships and 11 NCAA tournament appearances. * ANGELO PASSARETTA – A former Rhode island State Referee Administrator, he recently retired after 40 years as a referee. * FRANK PEARSON — A prodigious goal-scorer in England in the early 1900s for Preston North End and Chelsea, he founded the New England Soccer League, which operated from the 1920s until World War II. * FRED PEREIRA — A Mass. all-state player at Ludlow High School, he was an All-American at Brown University before a lengthy indoor and outdoor professional career, which included six appearances for the United States National Team. * DOUGLAS TASHJIAN — A R.I. all-state player at Cumberland, he captained the University of Rhode Island to the 1978 Yankee Conference championship and first ever school win in the NCAA Tournament. He later served as an assistant coach at URI and Harvard and spent five years as director of the Massachusetts Special Olympics soccer program. Tickets for the induction dinner are $38, and are available by telephoning Lillian Sousa at 401-434-6592 or by emailing soccerjbsousa@yahoo.com by the Nov. 12 deadline. All tickets must be purchased in advance; no tickets will be available at the door. Eusebio was not only a great player, but was also one of the most down- to- earth people I have ever known . He didn’t have a snobbish bone in his body. Copyright © 2010-17 New England Soccer Today.